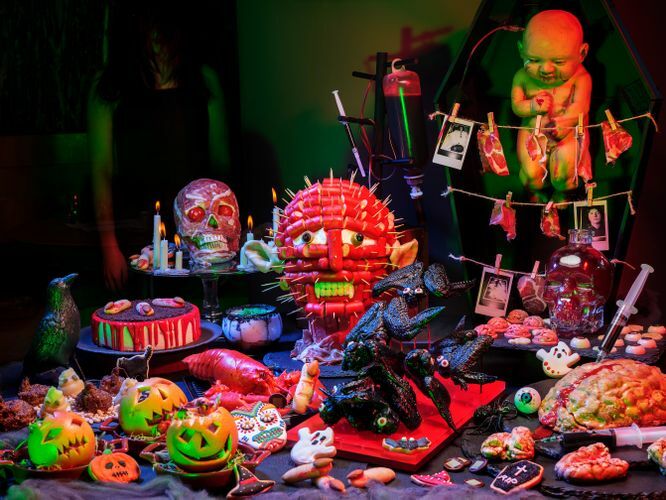 From 25 to 28 October, Parkroyal on Pickering’s acclaimed Halloween spectacular masterfully blends seasonal horror with culinary creativity rarely witnessed in Singapore, setting you on a spine-chilling gastronomic journey of discovery. Before you get started on the scare-feast, calm your nerves with some delicious Bat Wings (Braised Guinness Stout Chicken Wings). Once your fears are out of the way, let your hidden cannibalism fantasies shine through as you feed on the eerie-looking edible body parts such as the Einstein's Brains (Foie Gras with Raspberry Sauce), Broken Ribs (Pork Ribs in Barbecue sauce), Devil's Tongue (Sze Chuan Duck Tongue). Our chefs are dead serious about the live stations—where a sacrificial showcase of Roasted Baby Lamb, Suckling Pig Confit and Beef Sirloin will unleash your carnivorous instincts. Cross over to the dark side and indulge in some Nightmare Mac and Cheese and Graveyard Meatballs. You also won’t want to miss embarking the “Lime Ghost Ship”, loaded with crustacean delights such as Boston Lobsters, White Clams and Live Prawns. Finally, succumb to the ultimate sinful sweetness of the Blood Splatter Cheesecake (Cherry Cheesecake), Death by Berries (Berries Choux Choux) and Eyeball Panna Cotta. Lime’s signature Macha fondue will also morph into a Blood-filled Waterfall during this spooky occasion, overflowing with Strawberry-flavoured chocolate! Be sure to pluck up the courage to step into Lime’s private dining room which will be transformed into a dark enclave with additional bone-shaking gourmet thrills! And lastly, wash away any remaining trace of fear with a pot of Tea of Oblivion (Strawberry Consomme), and Witches Brew (Chendol)—which will hopefully wake you up from the nightmare you’re trapped in!